I want to go to NärCon!! 16 juni, 2013 Säg något! I really, really, really would like to be able to go to NärCon here in Sweden. They will have a very special guest that I desperately would like to meet in real life. NärCon will be held in Linköping on July 25 and will last a few days, but the special guest will be there on the 25th. Mr. Hideo Baba from Namco Bandai will be there! And I guess, people have no idea who this is. Well this name is the producer to the Tales of series, a videogame series I love very much. And he is coming to Sweden! My home country of all the countries!! Gah!! Since the Tales of series, is among my favorite game series. 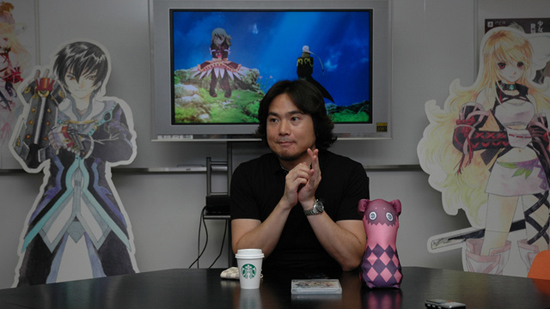 I would to be able to go and meet him and get my copy of Tales of Graces f signed. And just thank him for releasing more of the Tales of games outside of Japan. You’ll also be able try a demo of Tales of Xillia there. Would be nice, very nice indeed. This man has given me such games of joy, games that have helped me feel better when I was down and depressed. Hehe, no of course I don’t hope that will happen too my friend. But if it should happen…. I wouldn’t complain.